Ten dollars. At a yard sale even further up into the mountains than where we live. Where we also made some cool new friends. Not an electrical part on it anywhere. Completely human-powered. Seems to have all of the important (read: hard to replace) parts; what’s missing or loose can be replaced or adjusted. Don’t know when it was made, but it has a metal plate with a series of engraved patent dates, the most recent of which is 1886. Real wood. Real metal. No plastic in sight. In pretty good condition, considering its age. Beautiful. I’m looking forward to its company on cold winter nights, and am already imagining all of the things I can mend, make or re-make, with its help. But now, I’m off to harvest and hang to dry catnip, oregano and spearmint, check the chicken coop for eggs, and then help Peter put up fencing. My new treasure will wait. Out here, winter work is different than summer work. Next year we expect to produce all of our own milk, cheese, and eggs here on the property, in addition to a much larger portion of our fruits and veggies. It’s also likely that we’ll raise chickens or turkeys for eating, so a while back I volunteered to help with the chicken “processing” (killing and cleaning) at a friend’s ranch, as much to take measure of my own determination as to learn the skills involved. The skills have already come in handy! The Saturday before Thanksgiving, I was perusing the local Craigslist, and found someone offering two free Bronze turkeys. 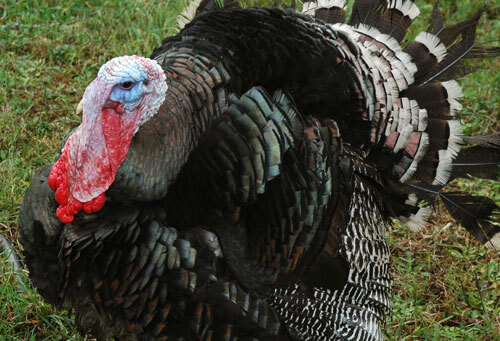 They were aging (the larger domestic turkeys don’t age well), and she didn’t want to kill them herself. The turkeys lived with chickens in a nice place just outside of Eugene. I liked the woman and felt that she cared about their welfare and was a fellow aficionado of “clean food”. These were turkeys I’d feel OK eating…well, one of them. The bigger one was a tom (male), and blind in one eye because chickens can be really mean. He was enormous and healthy, and ended up being our Thanksgiving bird. His name? Thanksgiving. That’s him at the top of the post. The other bird…she’s a sad case. “Improved” (intensively selectively bred) turkeys become so heavy so fast that they are often crippled just by their own weight. “Gimpy” isn’t as big as Thanksgiving (who must’ve been 30 lbs), but she has a deformed right leg and can only get around with a lot of lurching and flapping. The chickens saw this weakness, and began to peck her to death. They removed maybe a quarter of her feathers and left her with a multitude of raw wounds by the time she came to live with us. 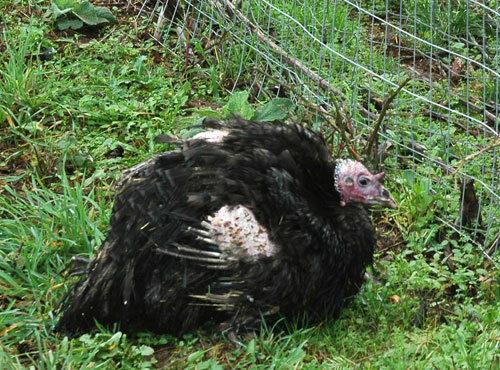 Our accidental pet turkey looks pretty unhappy in this picture taken the day she came home, but she’s perked up now. “Gimpy” originally escaped the butcher block because she just didn’t look healthy enough to eat. But something happened; as our neighbor put it, she “seems to want to live now”, so she’s a resident here for as long as she is satisfied with her life, though determining a turkey’s quality of life is guesswork for us. Away from the hectoring hens, she’s become more bright-eyed and energetic, and every morning we transport her by wheelbarrow from the predator-proofed henhouse to a grassy pasture where she can lurch about, eating bugs and grass and frustrating the hell out of our dog by her inaccessibility. The rest of the post will be about butchering the big male turkey, and you have to click “more” to see it. 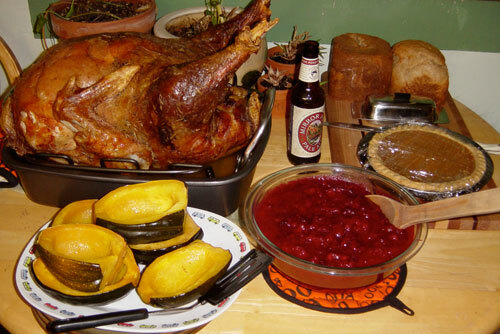 But here’s how it turned out – home-processed turkey, homemade cranberry sauce and squash from Teri, fresh baked bread, and (of course!) a pumpkin pie brought over by a dear neighbor who we shared the holiday with. Note the “store boughten” beer – something we’re working to phase out, but if you have to buy them, the Deschutes Brewery ones are all really good. If you’re a vegetarian, you might find the rest upsetting. If you’re not…well, this is the reality of meat, and it’s far more humane and hygienic than what happened to that “free-range organic” supermarket bird you probably just ate.